When your internal or contract software experts leave, there may be insufficient knowledge in-house to manage and support the enterprise systems. However, there are several steps you can take to protect your systems’ investment and retain years and years of knowledge. 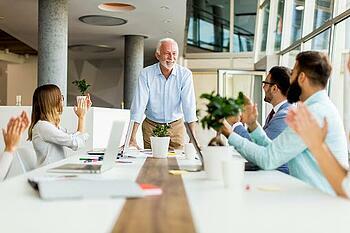 How are top companies coping with the retirement of IBM i talent? First of all, don’t let the thought of losing critical knowledge and experience freeze you in your tracks. Now’s the time to take action and protect your company. In many circumstances, retirements are announced months or years in advance. That means it’s time for you to get to work! Here are some steps that are being taken by top companies. 1. Invest in new and existing staff. When you think about it, the core issue here isn’t the loss of a particular individual (although he or she may be a highly-valued employee). At its most basic, the issue is a lack of planning and support within your remaining team members. It’s dangerous to leave so much critical knowledge affecting your business in the hands (or as it may be, head) of just one employee. To protect your investment in your systems and help ensure a seamless transition of duties upon the retirement of your senior staff, have those employees work in teams during the months leading up to retirement. Within those teams, ensure that veteran employees are transferring knowledge to newer employees. By communicating information across the generational divide, you’re also giving critical job security to your more junior staff members. While many IT professionals who got their start in the AS/400 days are nearing retirement, there is still a robust workforce on this stable platform who are hungry for knowledge and/or job security. By providing what these young professionals want and need, you will not only be protecting your organization against further attrition, you’ll be demonstrating a commitment to the rest of your talent. Turnover is an inevitability in every organization, so documenting core knowledge now can save you the stress of this situation again when more employees decide to move on to another role or company. Thinking beyond your IBM i platform. The IBM i lesson also opens up the need for continued training opportunities on all of the development and management tools you employ within your organization. Local technical schools, community colleges and private companies offer courses in these technologies (including RPG and PHP). Providing tuition assistance or sending members of your team for trainings on a range of technologies further protects your organization in the instance of one or two critical employees decides upon retirement (or wins the lottery). Taking a step further, consider recruiting employees directly from these technical schools, community colleges and private companies to bring fresh graduates with advanced skills into your organization. Going straight to the source can save your organization on training costs. Other sources of top development talent include user groups for specific programming languages or software products. There are user groups for just about every programming language or software product in every major city. These skills are in high demand and it is most definitely a candidate’s market right now. Getting to top talent where they spend their time is an excellent way to bring exceptional technical employees into your organization. Ensure your IBM i veterans are documenting this knowledge along the way. As part of the transition of knowledge to younger employees, have your veteran IT team members work on documenting their knowledge on modifications and custom software before they retire. Going beyond the literal knowledge of modifications and “how-tos” for the software, have your veteran operations staff work on documenting how the software is used in operations and supports the business. This documentation would include the literal day-to-day pieces of knowledge necessary to keep things moving in your company. Keep all your documentation in order. Chances are, your organization has some existing documentation in place. Now’s a good time to organize and verify those documents. For your off-the-shelf software solutions, verify you have the technical and functional documentation for the release of the software you are using. If you cannot locate the original documentation, contact the vendor to order a copy. Still coming up empty? Now’s a great time to go back to those user groups and see if a member can assist you. 3. Consider adding automation tools. A range of automation tools have hit the market in recent years to free up resources and create more consistent outcomes. There are a range of tools that can assist organizations with integration, change management and better development environments. Keep in mind that there is some work and research involved to determine which tools would be useful and a fit for your organization. Although automation tools cannot replace all the knowledge and delivery of an actual employee, they can often alleviate some of the task burden and provide consistency in key areas. If you are considering adding an automation tool to your arsenal, it’s important to implement and integrate the tools before veteran staff retires. This allows time for staff to build in some of their knowledge and hopefully give your organization the best of both worlds, so to speak. 4. Partner with a strategic expert. Taking these steps can help prevent chaos upon the retirement of your veteran systems staff. It can be difficult, however, to implement such massive steps while continuing with your typical day-to-day challenges and routine. Partnering with a strategic expert with proven expertise with your platform, software and industry can remove a majority of the burden from your organization and help ensure a seamless transition. Why does outsourcing feel so uncomfortable? How will you know if your company is ready to make the leap? You can double-down against risk by asking these questions. Our team is currently working with a large midwestern food distributor that serves restaurants and schools. They currently do not have any staff who knows their custom warehousing software or how to administer their Power i. We’re keeping things moving without a hiccup. We are also preparing a solution for a multi-national division of a durables manufacturer that cannot find local PRMS resources and would need support for their many instances of PRMS software across the globe. Another durables manufacturer and distributor runs software that predates the AS/400 and the original developer is no longer capable of supporting their software. PSGi is preparing a solution so that this organization doesn’t miss a beat. Here’s the bottom line: situations like these are extremely common. As an increasing number of teams are stretched to the limit with employee retirements and organic turnover, they are reaching out to partners who can help them augment their IT teams and maximize the return on their IT investment. Does your organization need help preparing for retirement or turnover? There is still time to put a plan in place and keep your organization humming despite staff turnover. Contact us today to learn more.